PART SIX: Resolutions you can keep! 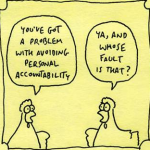 Step 4: Ask encouraging people to hold you accountable. Okay, you’ve reflected, you’ve written down a few specific, positive goals, and you’ve written out a plan for achieving your goals. Now you need some accountability. Ask a few optimistic, encouraging people to periodically check in to see you how you’re doing with your goals. And stress on the words “optimistic” and “encouraging.” No Debbie Downers. The last thing you want is a bunch of glass-half-empty people asking about your goals. When I made the goal to write a book, I asked one of my then-co-pastors to offer some accountability for me. I knew Jim had quite a gift of faith. He just seemed, more than the average person, to believe that big things were possible. And I knew he believed in me. Years before I made the goal to write my first book, Jim would tell me, “Matt, I can see your book on my shelf.” That is the kind of person you want checking up on you to see how you’re doing with your goals. I also decided to tell my church that I was going to try writing a book. Nothing so lights a fire under one’s tail than enlisting the aid of 700 accountability partners! I figured the Debbie Downers in the crowd wouldn’t bother checking in since they weren’t likely to believe in me. And the ones who did believe, who were excited to see this thing happen, would offer some needed encouragement along the protracted path toward a published book. That’s just what happened. Tomorrow: seeing the dream come true.